With its intoxicating aroma and an ensuing jolt of alertness, coffee serves as the daily wake-up call for many of us that helps us power through our lives. It’s no surprise that coffee is one of the most consumed beverages in the world. In a popular New York Times article in May (“More Consensus on Coffee’s Benefits Than You Might Think”), Indiana University School of Medicine professor Aaron E. Carroll outlined the persuasive evidence that coffee consumption is associated with a wide range of decreased health risks and increased longevity. A growing body of research points to coffee as a brew rich with antioxidants. It’s been shown to help ward off heart conditions, cancer, and Alzheimer’s disease. For the first time ever, the top nutrition advisory panel in the United States weighed in on coffee earlier this year: The Dietary Guidelines Advisory Committee noted that there are few health risks associated with drinking moderate amounts of coffee. Even better for coffee lovers, the panel cites “consistent evidence” of health benefits associated with drinking coffee and encourages people to boost their consumption to three to five cups a day, or up to 400 milligrams of caffeine. Though five cups of coffee sounds like a lot, most research equates a cup of coffee with 8 ounces, containing 100 milligrams of caffeine. A typical small coffee from your local coffee shop is 12 ounces with roughly 150 milligrams of caffeine. And even that small coffee can make a difference at the office — the links between coffee and productivity at work are strong. 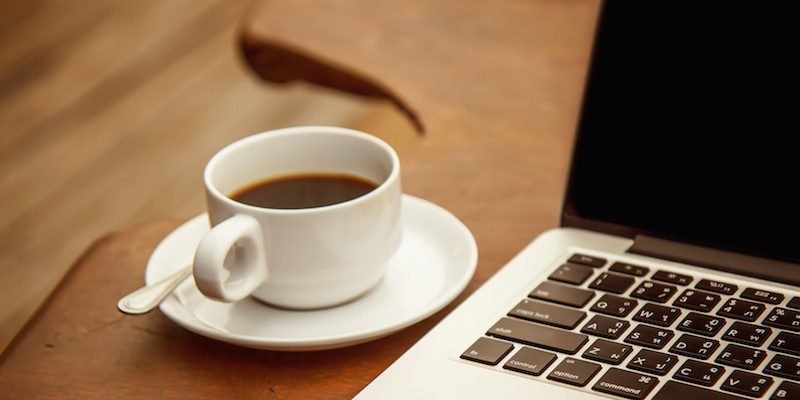 Nearly half the U.S. workforce agrees, with 46 percent noting that they are less productive if they go without coffee, according to a CareerBuilder employee survey. As long as you don’t overdo it and give yourself the shakes, drinking coffee can ramp up your productivity at work — and here are three reasons why. The caffeine in coffee doesn’t actually wake you up… but it does put a halt to the main compound in your brain that makes you sleepy. Called adenosine, the substance builds up throughout the day and lowers the body’s energy levels, which in turn fosters sleepiness. After you drink coffee in the morning — when you might still be tired from leftover adenosine in your system — or by refueling during an afternoon slump, caffeine blocks your brain’s adenosine receptors. With the receptors blocked, now your brain no longer thinks it’s sleepy. Meanwhile, the caffeine also ramps up your brain’s energy levels. More energy equals enhanced memory, ability to focus, problem-solving, and general cognitive function, according to a Nutrition study that reviewed scores of scientific research on caffeine. So when you need to concentrate on a crucial project at work, you can heighten your focus by sipping on coffee. Your brain will snap to attention, helping you plow through simple tasks or sort out the most complicated issues of the day. Some argue that coffee puts a damper on creativity because the alertness it fosters keeps the mind from wandering. And a dreamy, wandering mind is often conducive to creative, out-of-the-box thinking. But research from MIT and others supports the notion that coffee can help people be more creative both individually and in a group setting. Sitting together over coffee at work can break down normal social and professional barriers, leading to more casual or freewheeling conversations. For others, drinking coffee stimulates their brains, blowing out the cobwebs and making room for innovative thinking or a bolt of inspiration. Some thrive when they work in a coffee shop while getting their coffee fix. In that case, it’s actually the ambient noise that improves their creativity, according to a Journal of Consumer Research study. Low-level sound makes it tougher for the brain to process information, which prompts more abstract thinking and creative problem-solving. There’s a reason college campuses are home to numerous coffee shops. The coffee-fueled brain works overtime to help you learn faster and improves information retention. And you don’t have to be a student to need this competitive advantage: When you’re working in a setting where things are always changing, you can never really stop learning. A study from the journal PLOS One reports that 200 milligrams of caffeine prods the brain to identify words and phrases more quickly. The psychologists behind the research gave healthy subjects either a caffeine or lactose pill. Those who got caffeine were able to tell more quickly whether a string of letters made an actual word or a made-up word. Another study involving college students found that those who took 200 milligrams of caffeine could better recall words from six lists of 15 words each. The aforementioned Nutrition study also found that drinking coffee led to improved short-term memory and an increased ability to solve reason-based problems. Whether you’re studying for a certification exam or trying to master new material, coffee can make your learning time more productive. Of course, there can be too much of a good thing when it comes to coffee. Once you start drinking more than five cups a day, or 500-600 milligrams of caffeine, your body starts feeling over-caffeinated. The Mayo Clinic notes that side effects from drinking too much coffee include irritability, upset stomach, rapid heartbeat, muscle tremors, and restlessness. Some caffeine-sensitive people start feeling these effects with much less coffee. As coffee enthusiasts will tell you, drinking java is addicting, and drinking it too close to bedtime can keep you up at night. Of course, one option to avoid the jitters from too much caffeine is to switch to decaf. You’ll still get some of coffee’s positive health benefits without the nervous energy. For most people, however, drinking coffee in moderation will translate to improved performance at work. So fire up the espresso machine, get out the coffee grinder, or go find the filters. It’s time for for a fresh cup of coffee!